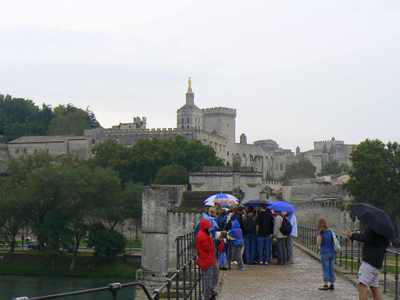 The rain caught up with us today in Avignon, but our spirits were not dampened as we toured the medieval city with our umbrellas in tow. The hard part was fighting the mobs of tourists as we competed for space in the Gothic Palais des Papes (Palace of the Popes), with its towers and turrets and 18-feet-thick walls, and all its fascinating history. Avignon became home to the Papacy in 1309 when Pope Clement V decided to install himself here, instead of in Rome like all the popes before him. 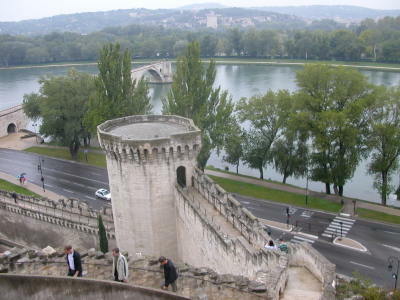 And here in Avignon is where it remained with the reign of seven popes, until the year 1377. In 1378 Pope Gregory XI decided to move the Papacy back to the Eternal City of Rome. Upon the death of Pope Gregory XI, the cardinals elected Pope Urban VI, an able administrator, but an unbearable pope, and they immediately regretted their decision. The majority of these cardinals removed themselves from Rome, and elected another pope, Pope Clement VII, who returned the papal court to Avignon. I guess there wasn’t room for both of them in Rome. And this was the beginning of the period of turmoil within the Catholic Church known as the “Western Schism”, with two popes rightfully claiming legitimacy at the same time. The Pont Saint-Bénézet was built in the 12th century, with a span of 900 meters, connecting Avignon to Villeneuve-lès-Avignon over the river Rhône. Major flooding had damaged the bridge over the years, but it was always repaired, however crudely, until a catastrophic flood in the 17th century finally took it out of commission for good. The bridge was named after a local shepherd boy who, according to legend, was inspired by angels to build a bridge over the river. Saint-Bénézet gained backing for the project from wealthy sponsors when he miraculously lifted a colossal boulder and threw it into the river, proving his divine intervention. 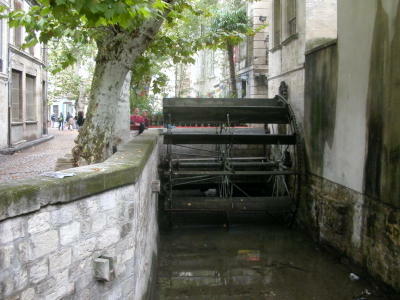 The River Sorgue runs along the Rue des Teinturiers in the form of a small canal, in which there are several water wheels that were used by fabric print dyers in the early 19th century, when this was the center of Avignon’s textile dyeing industry. This may have been the birthplace of all those Provençal fabrics we see everywhere in the form of such things as tablecloths, napkins, etc. It’s too bad we didn’t get a chance to try one of the cool little cafés or bars that line the street. 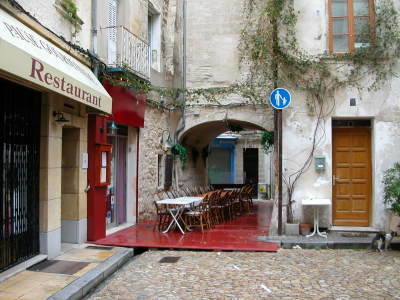 We continued strolling the rainy cobbled streets of Avignon, found a nice dry place to have a late lunch, and then got back into the car, with our bicycles in tow, and headed home to Antibes.